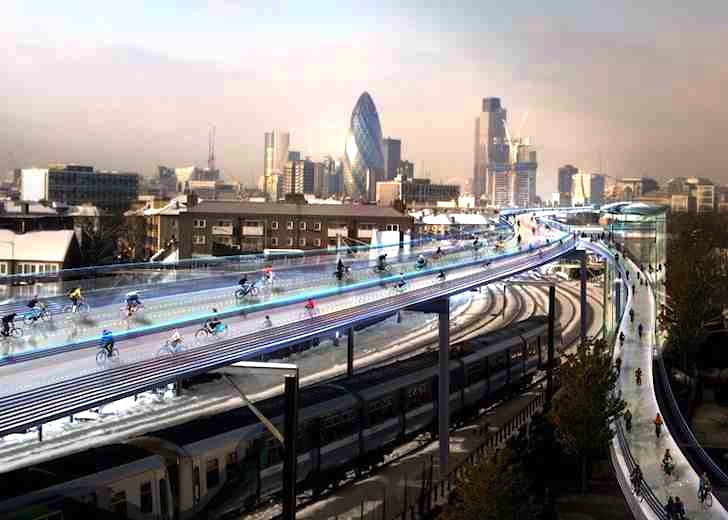 Architect and cycling enthusiast Sir Norman Foster just unveiled plans for the SkyCycle, a “cycle utopia” that soars up and above the congested streets of London. The three-story high bicycle highway is envisioned to cover 135 miles routed above the city’s existing rail lines. The sky-high scheme was created as a response to growing concerns over bicycle safety and the mounting physical constraints of adding on-the-ground segregated bike paths. In recent years, London has been stunned by a growing and unprecedented rate of cyclist casualties. 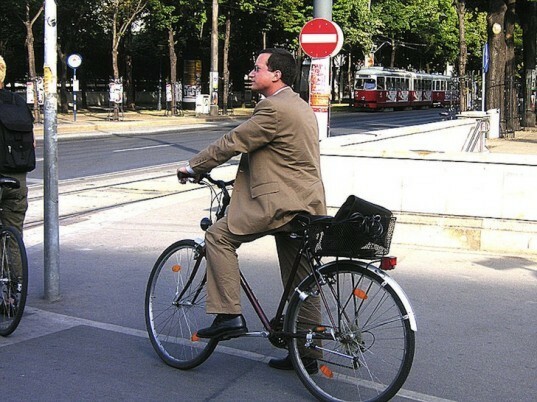 In November 2013, six cyclists were killed on the road within the span of two weeks. To address both safety concerns and the skyrocketing popularity of urban cycling, Foster proposed the SkyCycle as a safer and more effective transport system for future generations of cyclists. During rush hour, the bicycle highways could transport about 400,000 commuters and slash as much as a half an hour from commute times. @James DeWhitt People are heavy, once you get a lot of cyclists on these things. 4-6 bike riders can fit in the space of a car, and weigh easily around 1/4 the weight of a car. So it doesn't need to be as study as an elevated highway, but it still needs to be pretty solid. Also, you don't want it to feel flimsy, it should be sturdy enough that it doesn't flex under the weight of 100s of kg of people as the roll over. the bike highway still has to support the weight of ambulance and other emergency personnel/vehicles. Why are they so heavy? Are they concrete? Less than a 100th of the weight of an automobile. They look way too heavy and expensive. Surly there is another material that can be used here and the price reduced? Kevlar? Encased foam panels perhaps with a higher epoxy content. Reinforced grained glass, heavy plexiglass encasing solar panels. Needs a T bar pull too or ? Please apply your common sense and don't just spew out press releases: 1. "In recent years, London has been stunned by a growing and unprecedented rate of cyclist casualties." - Actually fatalities have fallen in recent years. Serious injuries have gone up. 2. With a fraction of the cost of this pie in the sky, London roads could be transformed for the benefit of people on foot and on bicycles, by prioritising walking and cycling. 3. The scheme totally misunderstands what urban roads are for and how cycling is central to city movements, not something to put out of sight. 4. The Brits are very good at inventing stupid grandiose schemes as an excuse for not doing the right things. In recent years, London has been stunned by a growing and unprecedented rate of cyclist casualties.